The radiation of the Plesiadapiformes is in large part Paleocene, predating the well-documented fossil record of primates, which is Eocene (however, Altiatlasiusis Paleocene, Sige et al., 1990). This is another reason why they have always been scrutinized in the search of possible primate ancestors or sister groups. Until recently, the plesiadapiforms were considered as a mainly North American radiation, with some families present in Europe having a North American origin. However, several Asiatic plesiadapiforms have been described, which increases the biogeographical complexity of the previous picture. Two carpolestids were reported by Beard and Wang (1995) from the Paleocene or Early Eocene Wutu fauna: a new derived species, Carpocristes oriens, close to North American Carpolestes, and the new genus Chronolestes, interpreted as a primitive carpolestid. This genus was subsequently reinterpreted as a much more primitive plesiadapiform (Silcox et al., 2001). A paromomyid was mentioned in the Wutu fauna (Tong and Wang, 1998), which is probably of North American origin. Another putative carpolestid, Parvocristes, was described from Pakistan (Thewissen et al., 2001). However, its P/4 has well-formed cingulids, in contrast with typical carpolestids. It does not resemble Chronolestes either. The referred I1/ is also unlike those of North American carpolestids; however, it resembles more closely the I1/ of Chronolestes. Such fragmentary material is difficult to identify; however, its attribution to carpolestids is dubious. From the same beds, the same authors describe a presumed plesi-adapid, Jattadectes, which is also quite difficult to allocate. Because the posterior molar seems much more salient lingually than the preceding one, it would be important to check if the last one could not be a DP4/. If the posterior one were an M1/, it could possibly pertain to Panobius found in the same locality and having apparently a comparable size (Panobius would then appear similar to some omomyids like Trogolemur). If examination of the specimen confirmed that the posterior tooth is an M3/ (e.g., if the metacone is much lower than the paracone), other affinities would be indicated, although probably not plesiadapid. With one paromomyid and one carpolestid pertaining to North American families and having likely dispersed from America to Asia close to the Paleocene-Eocene boundary, Chronolestes appears to be the only new genus, which creates an interesting problem. According to the analysis of Silcox et al. (2001), it branches between Pandemonium and [(carpolestids, plesiadapids) saxonellids], implying a very early branching. In the broader analysis of Silcox (2001), Chronolestes lies at the base of plesiadapoids. 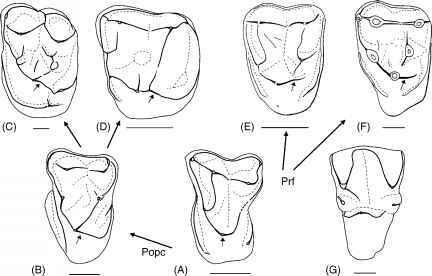 Because plesiadapoids have some molar characters that could be primitive (e.g., a centrally placed pro-tocone) in comparison with other plesiadapiforms and Purgatorius (Beard and Wang, 1995; Silcox, 2001; Szalay and Delson, 1979), Chronolestes raises the possibility that plesiadapoids could have an Asiatic origin. Their North American origin seems to require reversals of important dental characters, which are considered unlikely by this author to occur during a phase of radiation. After all, Purgatorius also should be of Asiatic origin.